You can now build flows using your favorite connectors directly within Azure IoT Central. For example, you can build a temperature alert rule that triggers a flow to send push notifications and SMS all in one place within IoT Central. You can also test and share the flow, see the run history, and manage all flows attached to that rule. 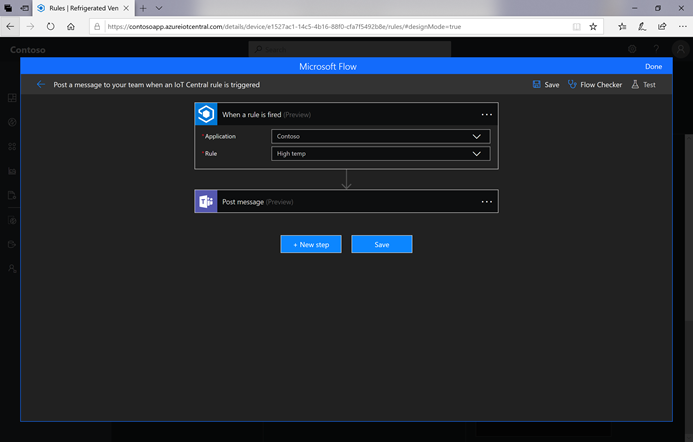 With the updated Azure IoT Central connector, you can now build flows that send commands to an IoT device and get device information like the name, properties, and settings values. You can even build a flow to tell an IoT device to reboot from a mobile app, and display the device’s temperature setting and location property in a mobile app. Go here to read more about this new integration between Microsoft Flow and Azure IoT central. Azure Key Vault – Azure Key Vault is a service to securely store and access secrets. MobilyWS – Mobily.ws enables Apps to send global SMS. 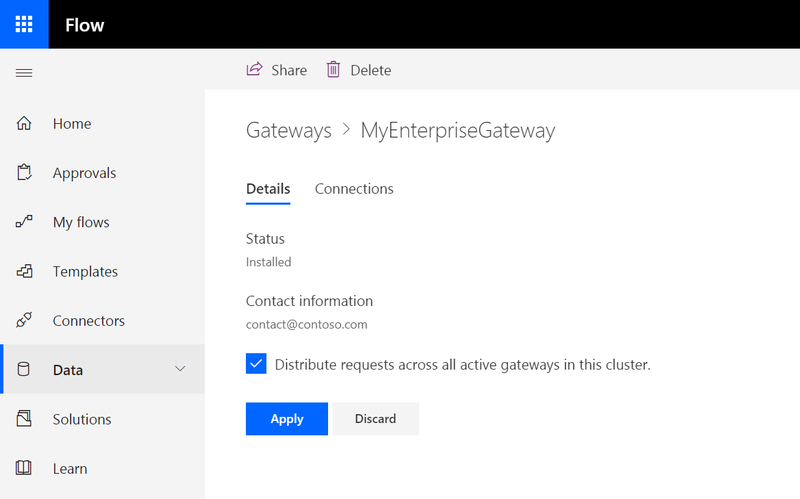 You can create high availability clusters of On-premises data gateway installations to ensure your organization can always access on-premises data resources used in Microsoft Flow and PowerApps. Such clusters allow you to group gateways to avoid single points of failure in accessing on-premises data resources. Flow or PowerApps by default uses the primary gateway in the cluster, unless it’s not available. In that case, the service switches to the next gateway in the cluster, and so on. Once you have set up a Gateway cluster you can now choose to allow traffic to be distributed across all gateways in a cluster. Select Gateways under the Data section in the Flow portal. Notice that the Gateway experience is now embedded directly in the Microsoft Flow portal, instead of taking you to PowerApps. Once you select a gateway, you can enable the option to Distribute requests across all active gateways in this cluster. There are two new improvements in the Flow checker and designer. First, the rich text editor released in November now allows you to toggle to an HTML Code View if you are an advanced user who would prefer to directly edit HTML instead of using the rich text controls. This new Code View will also be presented if there is content in the action that cannot be completely rendered in the rich text view. Second, the Flow checker can now take you directly to errors wherever they are in the flow. For example, if you have an error or warning inside an action that’s nested inside loops or conditions, clicking that error in the Flow checker will automatically expand those scopes and then scroll to where that action is. In addition, we have continued adding new rules to the Flow checker, including around connection health and potential infinite loops in SharePoint scenarios.